Smoothies have become more and more popular because of the amount of nutrients they can contain. This thick beverage is a blend of raw fruits and vegetables, with water or beverages made form almonds, rice, coconut or teas. The health of a smoothie depends on its ingredients. If the blend if not right, it might cost you more calorie intake. Liquids: Water, almond or rice beverage, green tea, coconut milk, coconut water or fresh squeezed juice. Herbs: Basil, mint, nutmeg, pimento, cilantro, ginger, parsley, oreganos, garden chervil etc. Extra dash of sweetness: Honey, Vanilla extracts, cocoa powder, cinnamon etc. Liquid Component – To mix the ingredients of a smoothie, a liquid is very essential. The most popular choice is fruit juice, but this could result in large amount of calorie intake. Instead of a juice consider half water and half almond, rice, coconut beverage or coconut milk. Herbal tea could also add a twist. The coconut milk would add a creamery texture. Seasonal Fruits – These fruits and vegetables have good amount of nutrients required in particular seasons. Fresh and seasonal fruits also add up to the flavor. Fiber is a must in any meal for health-conscious people. It takes longer to digest; hence, you do not feel hungry soon. Some seasonal fruits definitely match up to the fiber component in smoothies. When it comes to vegetables, adding spinach and kale are the most desired options, however, they do not affect the taste too much. 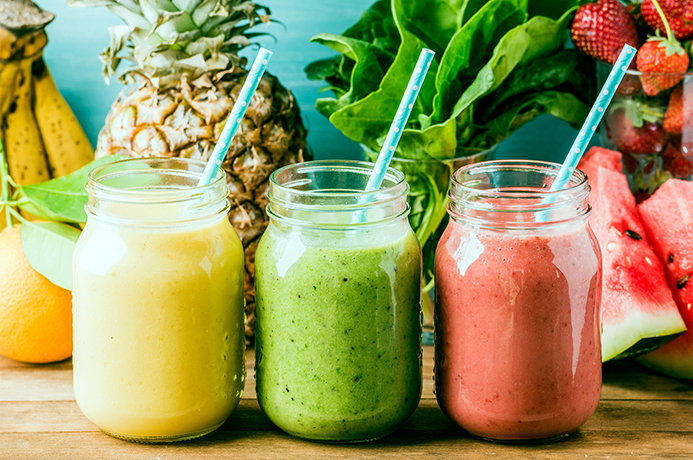 Smoothies are thicker than fruit juice because of the dietary fiber add-ons, making them healthier. You can even change the ingredients and experiment with new taste every week. This will keep you away from smoothie boredom. Green Smoothies – Spinach is the perfect choice for starters (green smoothie). The flavor is easy to get acquainted. Once the taste develops, you can probably try and experiment with other given options in the list above. Kale should definitely be on a later side due to its bitter taste; and if you are not used to the greens, you might end up adding a lot of sugar to your smoothie. Fruits add a little flavor here. Banana is the best choice bringing in flavor and thick texture. Green smoothie is usually a combination of green vegetables and fruits in a 40-60 proportion (approx.). Natural Sweetness – Smoothies from the store have added preservatives and sugar. While you prepare one at home, make sure to add natural sugar components. This will reduce the amount of sugar intake with no significant taste change in the sweetness of your smoothie. Remember, fruit juice also contain sugar. Hence, should not be used to fill up entire portion of your glass. Together with seasonal and fresh fruits, there are options for health-conscious sweet tooth. Coconut milk and water, honey, vanilla extract, dates, etc., can add up to the sweet taste. Adding sugar in any form may cause more calorie intake and also make you feel for the want of more eatables, soon. Some Protein – protein powders and nut butters are good sources of protein in smoothies. Full-fat yogurt can be added if there is not a dairy intolerance. Good fats such as, flaxseed ground or oil, olive, walnut and avocado add valuable nutrition and a smooth texture. Herbs can make a lot of difference in the taste. Try some from list above the next time you prepare a smoothie for yourself and feel the taste. Pimento is an excellent try. It has the flavor and aroma of many spices, like nutmeg, cloves, pepper, and cinnamon. 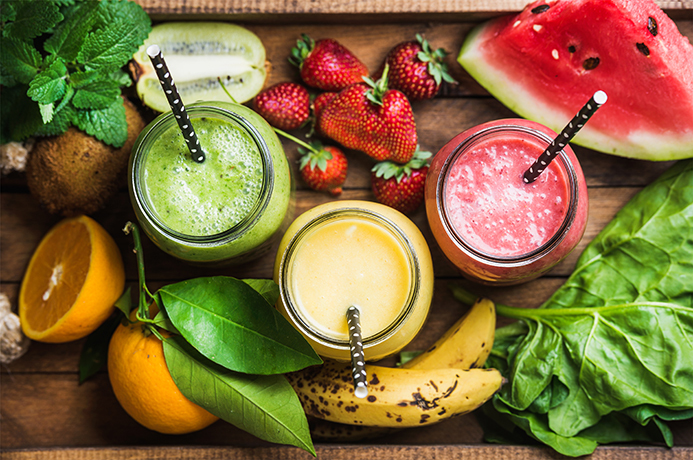 If you are on a cleanse with smoothies and feel the need to have a large quantity of them, do not go in for excess of fruits. They may disturb your calorie chart. Instead, look for avocado or oats. They are more filling and great source of fiber. Have fun preparing your smoothie, and experimenting with the new and healthy ideas. Share your blends with other health freaks. Stay healthy!